The Sims Freeplay- Community Challenges Explained! The aim of Community Challenges is The Sims Freeplay team set a challenge on the Monday for everyone playing to complete before the following Sunday, so The Spring Love Community Challenge started on the 21st May and will end on the 27th May. Prize: Spring Romance Bundle and 1 key! What do I think about this? The idea seems good but it definitely feels rushed, we all complained about the preteen boxes costing 4 keys each so we have been given this as some sort of apology! I think reducing the amount of keys needed would have been better (update- they have now done this so these boxes cost one key instead of 4, if you brought with 4 keys you will get 3 keys back!) It would be improved if we could see a progress bar on the game instead of waiting for pop ups to appear, I think if we could see how we are doing we would have more incentive to partake in it and more people would join in as I think some people might have missed this. If you have any other questions about community challenges let me know and I will try and find out the answer for you! This community challenge is a complete mess. For sure is a kind of apology for the 4 keys. I can’t see that pop-up progress thing. And that pink hair is for teens or what? I just have that hair for adults. Same, the pop up progression hasn’t appeared again for me since the first time. Just saw a pop-up that said we were 29% complete. I’m pretty sure my original pop-up said the next pop-up/update isn’t coming until about half way through the week, so I guess we won’t know the community’s progress until then. Hmm I’m second-guessing myself now. I’m not 100 percent sure where I got that info now, but I’m pretty sure it was in game/the first pop up. It was either that or possibly an official social media posts, but I definitely read it in relation to this community event and from an official source: the game itself or EA, Firemonkeys, etc. I see the Sims FreePlay FB possibly about it says: “Check in-game during the week for Challenge Goal % completion!” so there is a possbility I’m misremembering and saw it there instead. Hi! Thanks for posting this! I was somewhat confused by this challenge! I was wondering if the purchases must be ”outfits” or if any type of clothing will do? It is any clothing, sorry for the late reply! Thank you for posting this! As always, you are a tremendous help! You’re welcome! 🙂 Hopefully you will be able to partake in some of the future challenges! The community progress is displayed on the billboard in the town map. You can click on it to see the information up close. Mine doesn’t either, even though the pop up says “check the billboard”. The pop up did say updates will be on day 1 3 and 6 so maybe the billboard only shows updates on those days? HELP PLEASE!!! IM SO CONFUSED!!! i came here because you are my “go-to” for freaky freeplay related issues, cuz you are always up to date and on point, (SO THANK U SO MUCH FOR THAT…PLZ ROUND OF APPLAUSE FOR OUR “GIRL WHO GAMES”…. BUT YEAH..ANYWAYS…HELP!! i came here to find out about these simsfreeplay app notifications i have gotten twice now, concerning the “SPRING LOVE” community event, etc. I open up playstore, NO UPDATE. OK…, So i just open the game, it dl’s 9 mbs of extra game data, no biggie, the game comes on, and i STILL have no special event or anything going on. your article here lists may 21st as first day of event, I have logged in every day since the friday previous, and STILL NOTHINGGG!! WHATS GOING O HERE DO U THINK? i know youre not SFP tech support, but emailing them, the dang event will be over before i hear back or get any type of helpful response. i am a veteran player, i think ive missed like 2 events for a couple years, and i cant find any specific info on this “event…?!?,er..quest?!? ” i dont even know what it is…. please help!!! There are only a few pop ups that appear about community challenges, there is nothing really in the game, only a pop up when you open it so you wouldn’t know it was there unless you see the pop up which is easily missed. What if you already purchased all items in the mall? There’s nothing left to buy. Is there any other way to contribute? My preteen box updated to only one key. Yay! I guess EA listened to all the complaints. Btw your blog is the very best. I always go to you first. Thank you for your excellence. You can find them in the online store for free,everyone gets them even if you don’t participate. The boxes are 1 key now and the extra keys we spent on the first box are refunded. I just unlocked 5 boxes. Once this weeks challenge is over will I still be able to buy the clothes that are 25% off in the mall or are they limited time only ? Pls help. How to claim the prize? Hello! I see we completed the community challenge, yay! Now… where are the harajuku hairstyles?! Mine all still have prices on them, unless i’m Looking in the wrong spot ?? 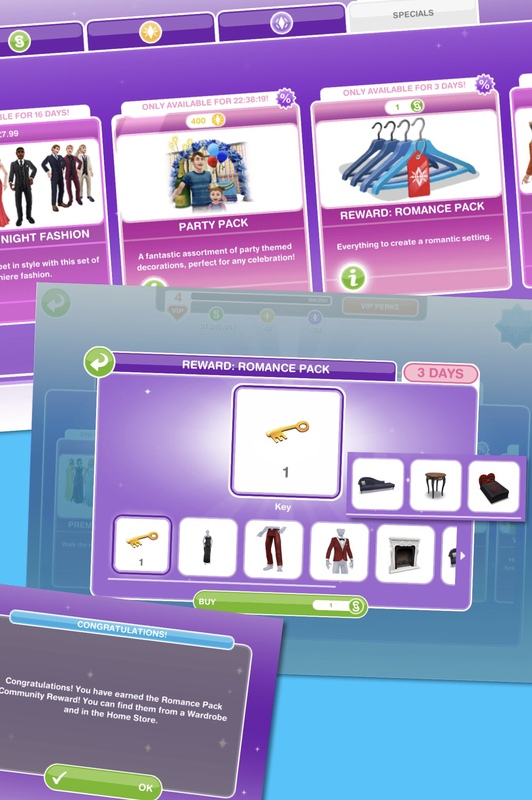 I already have the hairstyles myself so I don’t know exactly where they are in the online store, the online store is the shopping cart logo where you make purchases using real money. If you get the pop up again saying we won the prize click on this and it will take you directly to the store otherwise go to the online store and you should see the picture of the hairstyles unless you have unlocked the hairstyles already then you won’t get another prize. In the purple cart online store they are listed as reward: harajuku hairstyles for 1 simoleons. It was two for the teens and two for the adults. They gave the pigtail hairstyle in the image to the adults. Regarding the week 2 challenge, does it always have to be a pair of sims doing the romantic action? Or like does it count even if only one sim is doing it like the wait for partner option in the restaurant? Can someone confirm if ANY “pink” romantic-type interaction between sims counts for this challenge, or ONLY the 1-minute “Be Romantic” is what counts? Are you certain we get our keys back? I definitely didn’t even though I spent four for my first preteen box. The price has gone down to 1 key though. Is there anyone to contact about this? Thanks! I was able to contact them and got my keys refunded. What exactly is in the spring romance bundle? TIA!! to view the popup from the billboard you just have to refresh it (by going to a house and then back to the town-view) until it shows up. happy simming! Still doesn’t show for me..
Hi I know we unlocked the prize last week but I don’t know where to find the hair pack. I know you are meant to be able to see it on the billboard but I can’t, mine doesn’t show anything and I know others are having this issue too.